The Astros, the team that made everything look so easy during a 103-win regular season, made quick work of the Indians in the ALDS, sweeping the Tribe after an 11-3 win in Game 3. Houston now moves on for the second straight year to the American League Championship Series, where it will face the winner of the Red Sox-Yankees series. Here’s are some thoughts on the Astros’ Game 3 victory and three-game sweep of the Indians. 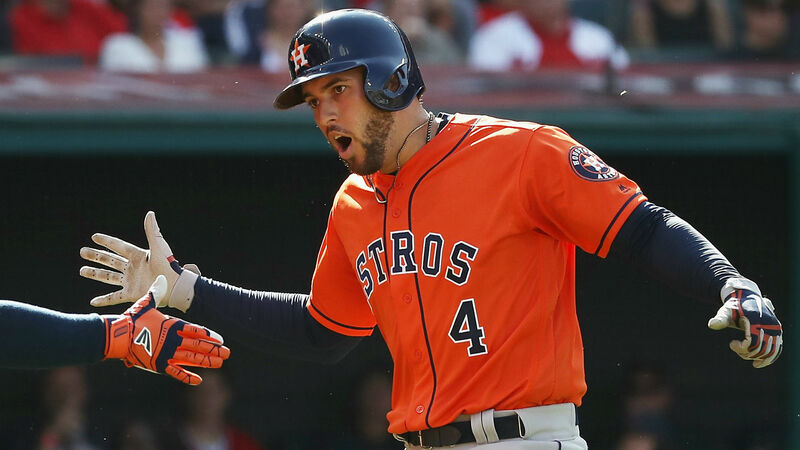 During the regular season, George Springer is a two-time All-Star and a vital cog at the top of the Astros’ order. But in the postseason, Springer looks like a first-ballot Hall of Famer. Hyperbole, perhaps, but Springer is once again having a beastly postseason. The 2017 World Series MVP homered twice against the Indians in Game 3 and finished the series with three home runs, going 6-for-14 at the plate. Springer now has 10 postseason home runs — an Astros record — in 27 games. No one expected what he did in the World Series last year (five home runs, 1.471 OPS) and to expect him to continue at that level this postseason is unreasonable. But he did in the ALDS. There’s no way he can stay this hot in the ALCS, right? Stay tuned. The Astros shortstop has been mired in a terrible slump lately. He hit .180 from Aug. 10 through the end of the regular season, and was hitless in seven at-bats in the first two games of the ALDS. But manager A.J. Hinch said after Game 2 he still had faith in Correa. Correa started Game 3 0-for-2, but came up in the eighth with the Astros in control. With the pressure off, Correa took a Brad Hand pitch to the opposite field bleachers for a three-run home run. Maybe that’s the spark Correa needs to get back on track at the plate. He’s certainly a much better hitter than he’s showed in recent weeks, and he looks like he’s put the back issues that landed him on the DL behind him. That’s good news for the Astros, who really need Correa to get going in what will be a tough ALCS matchup against either the Red Sox or Yankees. After a strong five innings from starter Mike Clevinger (nine strikeouts, one earned run), the Indians turned to Trevor Bauer to protect a 2-1 lead. Making his third appearance of the ALDS, Bauer has been outstanding for Cleveland this year, but he picked a bad time for a bad outing. Bauer gave up three runs in 1 1/3 innings of work. Although he gave up four hits, much of the damage he incurred in that three-run seventh inning was self-inflicted. He picked up his first error on an errant pickoff throw to first. Then, when Alex Bregman sent an easy bouncer back to the mound, Bauer picked up another throwing error with a bad throw to second base. It should have been an easy double play that would have stopped the bleeding and kept the score tied at 2. Instead, two more runs scored, and Bauer’s day was done. What can you say? Everyone has a bad day. Bauer’s outstanding season just had an unfortunate ending.